The other day (or once upon a time, whatever), I tried to use Gmail to send an attachment encrypted with SecureZIP. I was quickly reminded by the Google email service that it didn’t allow encrypted attachments. So I tried our restaurant’s Yahoo mailbox. Same result. I needed to send a secure attachment, and I didn’t want to sign up for a for-fee service to do so. So I searched the Web for a free secure mail service. I found two which show promise: Lockbin.com and SendInc.com. Lockbin.com was simple to use. 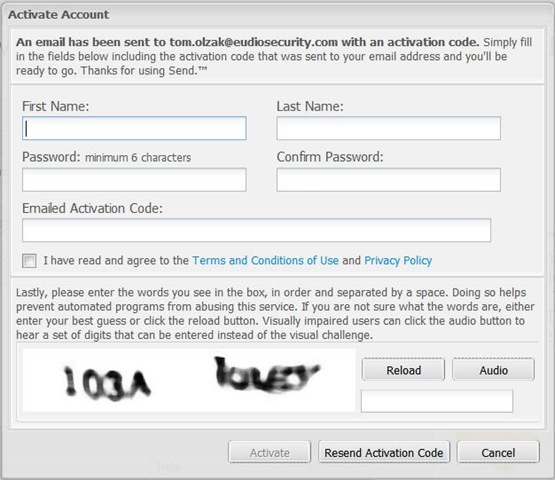 After accepting the user agreement and entering a CAPTCHA string, I was presented with the text entry form shown below. Since the connection established with the site was encrypted (HTTPS), anything I entered and sent was safe from unauthorized sets of eyes. I entered a short test message and clicked Continue. The next window (below) prompted for a password to lock the message until picked up by the recipient. The password, or “Secret Word,” has to be sent to the person receiving the message via standard email, phone call, text message, etc. I entered a password and clicked Continue. Finally I was prompted for my name, my email address and the recipient’s email address. I was also shown how the alert message would look when it showed up in the destination mailbox. The text was not editable at this point. Clicking enter again, the message was sent. Since I had sent the test message to one of my addresses, an alert quickly appeared in my mailbox (shown below) letting me know I had a secure message to retrieve. To read the message, I clicked the link as instructed. This opened a secure session with Lockbin.com. After entering the password I provided when I sent the message, I was shown the message text. Simple, but not quite what I needed. There are two potential issues with Lockbin. First, the sent email is deleted from the Lockbin server as soon as the recipient opens it. If the person you correspond with doesn’t understand this, you might find yourself resending it. Second, Lockbin doesn’t support attachments. This is OK if what you want to share is a small list of private data. However, I needed to send a complete document. So on to SendInc. 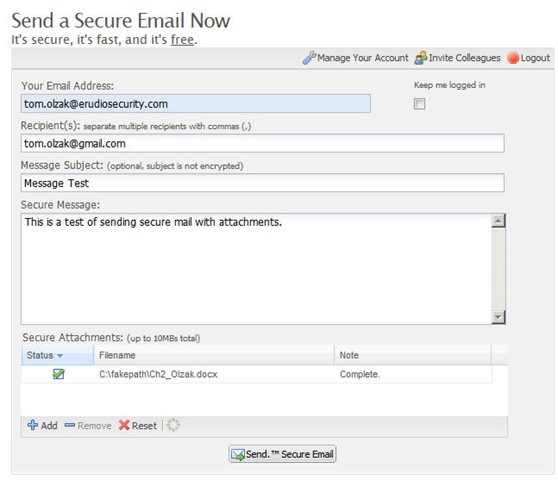 Like Lockbin, SendInc is a free secure email service which requires no downloads. But unlike the first solution, SendInc is a better fit for home office or small business use. With SendInc, I can send up to twenty messages per day. This would be a serious limitation for larger businesses, but it’s fine for my needs. And although there is a send limit, I can receive an unlimited number of secure messages. The best thing about SendInc, however, is that I can include attachments up to 10 MB. With Lockbin, no account is necessary. This is not true with SendInc. This is probably due to the eventual offering of a for-fee service for users with a need for more than 20 outgoing secure messages per day. SendInc knew immediately after I entered my email address that I didn’t have an account. I was presented with an account activation form. Once the form was complete, I entered an activation code sent as the final form completion step. Now I was ready to enter the test message, as shown below. After entering my test message and attaching a 5 MB Word attachment, I clicked the send button at the bottom of the form. The email was immediately processed, and I received a notification in my Gmail account. The following image shows the contents of the alert. Again, I simply clicked the provided link to establish a secure session with SendInc. However, the Gmail account I sent the message to was not registered with SendInc. So I was required to activate an associated account with a form similar to the one I completed when activating the sending account, as shown in the following image. Once both accounts were activated, I was able to send and receive secure messages with them by supplying the relevant passwords. Messages once processed are not retained by SendInc. Both of these solutions work as advertised. Neither are perfect, and I wouldn’t use them to share national defense secrets. But I don’t deal with national security issues. For quick messages without an attachment, Lockbin is certainly easier to use. For attachments, there is always SendInc. Some organizations spend a lot of time worrying about administrative (policies) and logical (application and system electronic) access controls without much concern for physical security. I don’t mean the kind of physical security where you make sure your data center is locked. I mean the kind of security which allows you to track who has your resources and ensures your organization takes the right steps to quickly mitigate impact. …13 computers were missing and… nearly 20 percent of more than 2,500 computers sampled could not be specifically located. Compounded by the Department’s lack of computer accountability, its absence of encryption requirements leaves the Department vulnerable to sensitive and personally identifiable information being lost, stolen, or misused. Source: Evaluation of the Department of the Interior’s Accountability of Desktop and Laptop Computers and their Sensitive Data, U.S. Department of the Interior, Office of the Inspector General, 24 April 2009. Despite policies mandated by the Federal Information Systems Management Act and other regulations, including rules that say computers should not be left unattended in plain view and that organizations should establish policies to protect their systems from unauthorized access, the Department of the Interior doesn’t require that any hardware that costs less than $5,000 — that would cover most PCs — be tracked in an asset management system, and the current tracking system doesn’t have proper backing, according to the report. Most of us agree that encryption is a necessary part of any mobile device security strategy. But why worry about tracking laptops? Isn’t encryption enough to render the data on a lost or stolen laptop inaccessible? Well, it depends.